Number World is a location in Mario's Early Years! Fun with Numbers. It is one of the seven islands in the game and is represented by a set of numbers going from 0-3. In this world, the player has to select the number indicated. The first level involves selecting the number above hotel rooms which get transferred down to a conveyer belt. The second level involves choosing house numbers to fill up a mailbox. The third involves a grocer where the player has to fill a TV screen. 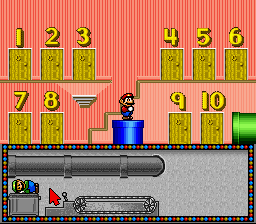 After the player selects the correct answer, a character pops up to encourage them, then after five correct answers, they move on to the next room via a pipe. The first area is the inside of a two story-hotel. The second area is a neighborhood with four houses and some trees. The final area is a generic supermarket checkout; the player exits through a blue pipe in this room. This page was last edited on February 16, 2019, at 20:35.